Beginning from top-left, McAllen ISD candidates Marco Suarez, Juan Cano, Conrado "Ito" Alvarado and Lynse Guerra are seen; from center-left, Tony Forina, Gina Karam-Millin, Daniel Vela and Don Delaney are shown. City of McAllen hopefuls seen, from bottom-left, are Joe Califa, Tania Ramirez, John Ingram, Victor "Seby" Haddad and Mark Murray. The Monitor will host six separate debates sponsored by IBC Bank via livestream on its website, themonitor.com, beginning at noon Wednesday, April 17. 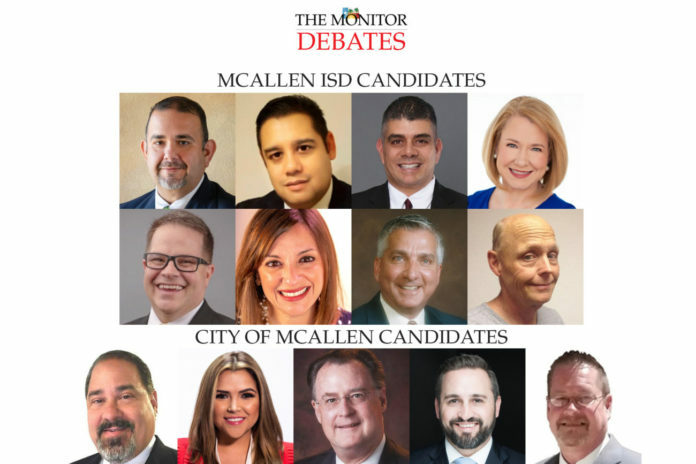 The debates will feature candidates for the two contested McAllen City Commission races and the four contested McAllen ISD places. The candidates will make their case about why they’re best suited for elected office. Topics up for debate for city candidates will include recent immigration news, business and retail growth, infrastructure concerns, and any local political matters that have recently dominated headlines. School board hopefuls will tackle topics such as curriculum, increasing enrollment, facility needs, testing standards and teacher pay. The Monitor may also use questions from the public during the debates. On April 9, The Monitor will begin asking its readers for questions via its social media pages. Monitor staff writers Naxiely Lopez-Puente and Mitchell Ferman will serve as the moderators for the school district and city debates, respectively. The debates are not open to the public. If you can’t watch the debates live, each debate will be available to watch on themonitor.com.